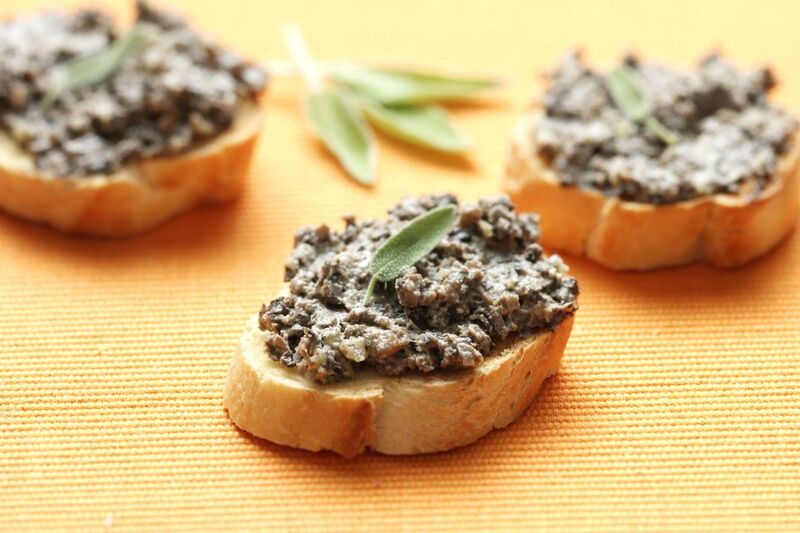 No need to eat chopped liver; try a vegetarian pate made from mushrooms and fresh herbs instead. Not sure what to do with pate? Spread it on bagels for a casual lazy breakfast, serve it with artisan bread or service it with crackers for a party appetizer for a holiday or Christmas party. This vegan herbed mushroom pate recipe is a humane take on more traditional pates, while still serving the same purpose in a delicious way! In a large saucepan, heat the margarine and cook the onion for 5 to 6 minutes, until soft. Add the mushrooms and cook for another 8 to 10 minutes, until well cooked. Remove the mixture from the heat and add the garlic, chopped parsley, rosemary, bread crumbs and lemon juice. Transfer to a blender or food processor and pulse until desired consistency is achieved. The pate should be finely pureed until it has a smooth texture. Traditional pate is a spread made from ground meat and fat that is combined with wine and spices and pureed into a spreadable paste. The meat used is typically fattened liver, which is often raised in a controversial and inhumane manner. In order to fatten a duck or goose's liver, farmers participate in a method of force-feeding called "gavage" where a tube is inserted into their throats and food is funneled into their stomachs. These birds often live in cages, sometimes in total darkness, and live under conditions meant to fatten them with excess food and very little movement. While foie gras, or fatty liver, is considered a delicacy in many restaurants, the way it is produced should not be ignored. In fact, foie gras production is now banned in Israel after the country's supreme court ruled it violates Israel's cruelty-to-animals laws. Germany, the U.K., and Switzerland also prohibit force-feeding birds.